Jake came to Enable in 2017 when he was first looking for employment. Jake was fresh out of college and although he was determined to find employment, he needed some support with CV writing, attending interviews and discussing his needs with employers. 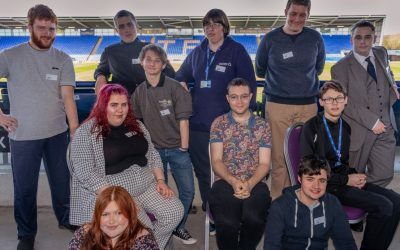 Enable supported Jake to secure a level 2 apprenticeship with Shropshire Council’s IT department where they continued to support him post-employment through Job Coaching. When Jakes apprenticeship came to an end he returned to Enable, where it was agreed that both BBO and the Shropshire Disability Employment Service (part funded by Local Supported Employment Project) would work together to give Jake the tailored support that he would need. 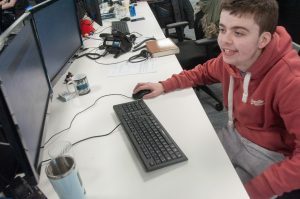 Jake said that he found the job search a lot easier the second time around as he was able to apply the job searching skills he had acquired previously with Enable and managed to secure himself an interview independently. 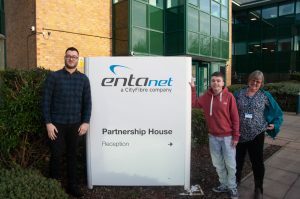 Jake’s interview was a success and he was offered a level 3 apprenticeship with Entanet, a Telford based data and voice connectivity provider. Working within the BBO Team, Di was able to arrange a reserved parking space for Jake at his new office which helped him to feel more confident when arriving at work as he knew he would have somewhere to park that would be accessible to the building. Di was also able to arrange BBO funding for Jake’s petrol costs to be substituted before his first pay cheque to allow him to travel to work without the worry of money. When Jake was asked what his favourite part of the job was, he said; “Everything! I can’t think of anything that I don’t enjoy. I am part of a really great team, I’ve made lots of friends and have great management. Due to the support from Enable and his effective management at Entanet, Jake was able to easily overcome any challenges when starting his new role. Initially there was a lot to learn, however the company offered a fantastic induction to help with this. Jake’s Job Coach, Meg, spent time with him and his manager working out a “map” to consolidate the relevant information in an easy to follow order. Meg would also attend progress meetings with Jake and his Manager, Adam, to ensure everything was going smoothly for both parties. Ultimately, though, the job match had been so accurate that this helped to minimise any potential challenges. The support Jake needed was to basically learn, understand, and implement processes for problem solving Entanet client issues. Jake’s Job Coach, Meg, used the reinforcement technique in a natural setting which in this case was the workplace. Meg and Jake practiced sequencing various scenarios. This is a framework for breaking a task into smaller more teachable steps as necessary. Entanet’s in-house training takes place in an extremely supportive environment and allowed both Meg and Jake to develop learning strategies. As the tasks that Jake was required to do consisted of several steps for each scenario the “chaining” format was selected for his learning. This consisted of forward chaining, backward chaining and mixed formats incorporating a diagram where procedures were mapped out. When asked about any challenges that came from Jakes employment, Adam said; “He has been absolutely no problem. Enable have been really helpful and Jake has done extremely well. He’s come in, very fresh faced with 12 months experience which has helped in this role. Jake required a specific chair to allow him to sit comfortably at his desk, luckily these chairs were already offered to all staff, making it easy for Jake to obtain one and emphasised an inclusive environment. Jake feels that he has benefitted greatly by pursuing the apprenticeship route. The office that he works in is understanding and inclusive and offers fantastic teamwork and communication. He enjoys the hands on aspect of an apprenticeship and says that he loves the feeling of contributing to the company and wider community. The nature of Jake’s apprenticeship allows him to work at his own pace, this is something that his Manager, Adam, feels is important; not just to Jake but also to allow Jake to offer the best possible customer service. 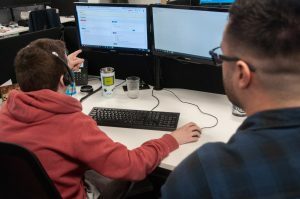 Adam followed this by saying that Enable has been useful for Jake as they have provided him with a point of contact for him to use or go to during the first few months of his apprenticeship.